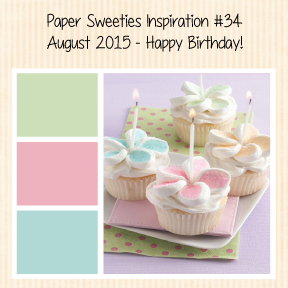 MackieMade Paper Creations: Paper Sweeties August Rewind! Today's card is really SWEET!!!! I signed up for the "Online Card Classes:Background Check". One of the classes given by the wonderfully talented Laura Bassen taught how to make this window card. I don't think you are able to see in this photo, but the sentiment has been stamped on acetate with black StazOn ink! There is foam behind the white panel to make a window. None of this dimension is showing up in the photo, but it looks real cool IRL!!!!! Sweet is from the Sweet As Can Be Sweet Cut from the May 2015 collection. I stamped lots of candies from the NEW Let's Party stamp set, colored them with Copics and then cut them out with their matching Sweet Cuts! 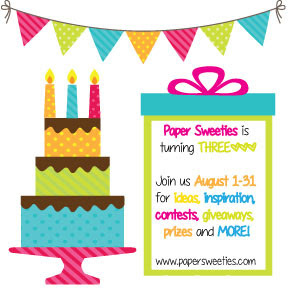 Please go visit my Paper Sweetie Teamies for some GREAT inspiration! What a wonderful window technique! Such a great card my dear!!! I love it! Yum they look good enough to chew on, so bright and cheerful and I love your window. Oh, this is so sweet Mackie. Love the bright and cheerful colors. The pearls look perfect. So beautiful in bright colors and so fun!!! Love the window, sentiment, and wrapped candy!!! This is a great card. Love how you stamped on the acetate and added the dimension with the foam. I also took the Online Card Class and adore Laura Bassen. I could listen to her all day, what a great sense of humor. So so pretty! Love all the colors, such a fun design too! Mackie, this card is so cute! Love all the bright, colorful candies against a white background, and the acetate window is fabulous. I could tell it was acetate because I could see the shadows of the text on the yellow paper. Definitely a sweet creation. Like the dimension it has.